Every year, the next-to-junior Past Master of Friendship Lodge gets the the unenviable task of gathering together a large group of his predecessors for the purpose of putting on a Master Mason degree. We typically hold two sets of degrees, one in early spring and one in the fall, and the Past Master’s degree is performed at the Master’s discretion. Some choose to do it early to give them more time to study for their own degree. I chose to have them do it in the fall. This year, my friend Dave was the cat herder. Since my own Master Mason degree had been performed in another lodge, he asked if I’d like to reprise my role, or at least a part of it. How could I turn down such an offer? So he took the Senior Deacon’s chair while I took the East for the last degree that I’d perform as Master of Friendship Lodge. We had three candidates, including the now-youngest member of the lodge; Connecticut lowered the admission age to 18 back in April, and Coulson applied shortly afterward. Being a DeMolay and currently the chapter Master Councilor, he already had some inkling – but only an inkling -of what was to come. Coulson is a fine young man, to the amazement and perhaps even consternation of his father, Doug. 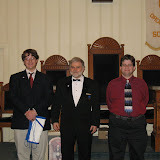 Coulson was joined by Rob, another Senior DeMolay from Marcus Holcomb Chapter. Finally, we had Leo who brought a long-time friend of his: WB Alvin from Composite Lodge in Bloomfield – one of the several Prince Hall lodges in Conn.
A little history: Connecticut was the first state to recognize Most Worshipful Prince Hall Grand Lodges in 1989, and Friendship Lodge was the first Connecticut lodge to arrange a visitation with a nearby Prince Hall lodge. We have full recognition in both directions, and so it was my pleasure to have WB Alvin on hand to assist in raising his friend. To top it off, we planned the largest meal of this year, a Surf & Turf dinner with lobsters and some exceptionally tender fillets, lightly seasoned and pan seared, then wrapped in bacon and cooked to a juicy finish. Except for me; believe it or not, I’ve got a nervous stomach and rarely eat before a degree – maybe a slice of bread or a few sips of diet soda. Afterward, though, I found one of the very few leftover fillets and started picking at it. This freaked out a few people because it was only pan seared – to them, I was eating “raw” steak. It was the most tender piece I’d had in months, though. Turned out that the piece belonged to Richie, one of the (slightly) older guys that I consider as a mentor. Richie took the East for the drama in the last half of the degree. I felt almost badly about eating his dinner, especially since there weren’t any leftovers. We planned for 40 dinners – a big night at our little ol’ country lodge – and only picked up a few extras. Sorry, Richie! In theory, the Past Masters should be seasoned old pros, all serious and somber while performing the work of the evening. More importantly, at the end of the evening we had three new Master Masons who will never forget being raised in Friendship Lodge. The Haitian Degree Oh Yes it’s Ladies’ Night, Oh What a Night!